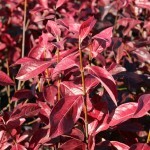 A dense shrub with lustrous, deep green leaves that turn a beautiful wine-red in the fall. The early summer, creamy-white flowers are followed by berries that start out white, turning to pink and then bright blue as they mature. Will produce more berries if planted near 'Brandywine'. It grows best in full sun to part shade in an average well-drained soil. Prune as needed in fall.